Born in Sydney Australia, Joanne began playing the bassoon when she was 13. At seventeen she was awarded an ABC orchestral scholarship. Five years later with the desire to propel the bassoon beyond its role in the orchestra, she left orchestral life to pursue and explore other musical possibilities. Joanne is Australia’s and one of the worlds leading improvisers and exponent of extended techniques on the bassoon. She has played, studied, composed, and performed across a variety of music traditions and genres including Jazz, South Indian Carnatic music, new music repertoire, improvisation and computer music. In collaboration with Stuart Favilla, Joanne has been making, playing and researching digital musical instruments since the mid 1990’s. 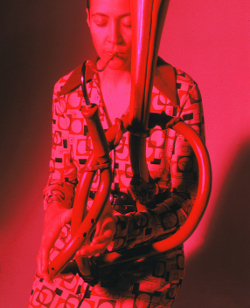 Within their Bent Leather band duo she has developed unique and spectacular digital wind controller instruments including the Serpentine Bassoon and the Contra-Monster. Work of the Bent Leather Band has been recognized internationally through prizes, awards and many concert and festival invitations. Joanne is currently undertaking her PhD on digital musical instrument systems within the department of Computing and Information Systems (CIS), Interaction Design Lab (IDL) University of Melbourne Australia. She holds a Masters degree and a B.Mus degree from the Victorian College of Arts University of Melbourne. Her post-graduate studies have been supported through Australian Postgraduate Award (APA), Melbourne Research Scholarship (MRS), Overseas Research Experience Scholarship (ORES), Melbourne Travelling Abroad Scholarship (MATS) and IDL Google prize.